Explanation: Mercury's surface looks similar to our Moon's. Each is heavily cratered and made of rock. Mercury's diameter is about 4800 km, while the Moon's is slightly less at about 3500 km (compared with about 12,700 km for the Earth). But Mercury is unique in many ways. Mercury is the closest planet to the Sun, orbiting at about 1/3 the radius of the Earth's orbit. As Mercury slowly rotates, its surface temperature varies from an unbearably cold -180 degrees Celsius to an unbearably hot 400 degrees Celsius. The place nearest the Sun in Mercury's orbit changes slightly each orbit - a fact used by Albert Einstein to help verify the correctness of his then newly discovered theory of gravity: General Relativity. 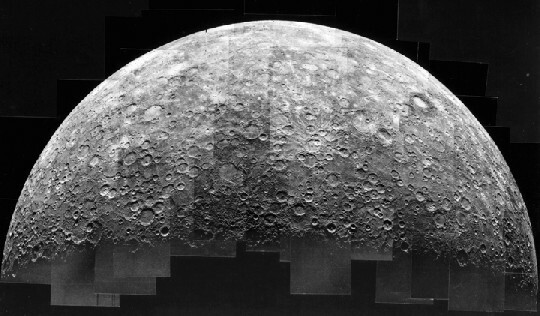 The above picture was taken by the only spacecraft ever to pass Mercury: Mariner 10 in 1974.